Place the pecans and sugar in the workbowl of the food processor and process until coarsely chopped. Add the butter, molasses, flour, cream, and vanilla and continue to process until well mixed and the nuts are finely chopped. Remove the dough from the processor bowl. Preheat oven to 350º. Line an 18 x12-inch baking sheet pan with aluminum foil. Place a scant tablespoon of the dough on top of the foil, spacing the cookies far apar and leaving lots of room to expand, only 6 cookies to a pan. Place in the oven and bake for 10 minutes, or until bubbly all over and golden brown. Watch the first batch of cookies carefully as they turn from brown to burned very quickly. The baking time may need to be adjusted according to your oven. Remove from the oven and place, still on the foil, on a cooling rack to cool completely. Continue to bake the cookies in batches until all the dough is used. Peel the foil away from the back of the lace cookies very carefully once they are cooled. It is very easy to break the cookies, so be careful. Set aside. If holding cookies for any length of time place in an airtight container. Place the cream in a bowl and whip by hand or with electric beaters until fairly stiff. Stir the mascarpone, Grand Marnier, sugar, and orange rind into the cream in until the mixture is smooth. Use immediately or set aside and refrigerate. To assemble, place 1 lace cookie on a dessert plate. Spread or pipe using a pastry bag1 tablespoon of the filling gently on the cookie. Place 4 raspberries, equally spaced, on the filling. Repeat. 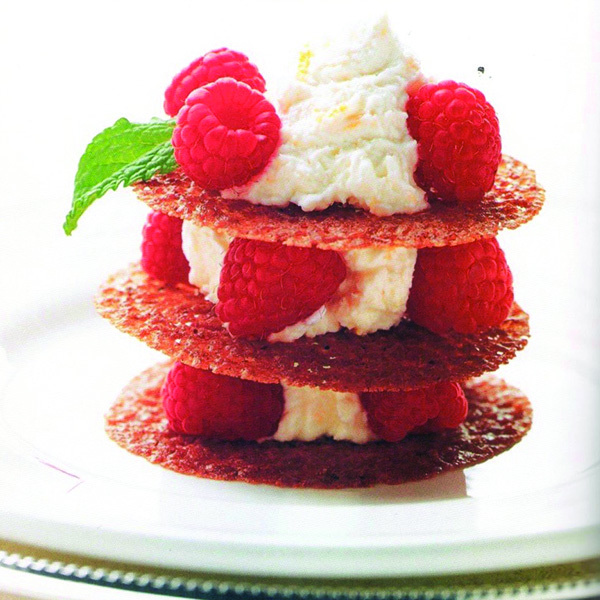 Place a third cookie on top of the raspberries and top the with 1 tablespoon of the filling. Garnish each completed dessert with 8 more raspberries and a mint sprig. Serve immediately. Copyright © 2000 by Paula Lambert, The Cheese Lover's Cookbook and Guide, all rights reserved.